A venue for the artist’s public installations and a program of Coney Island USA. 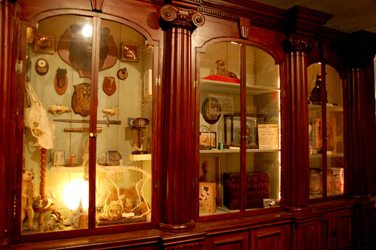 The museum is an institution as art installation with a collection of over 7,000 artifacts related to the history of Coney Island. 2004-present. Institution as Artwork: “The collectors cabinet”, featuring materials from private collections. Exploring the history of museums and ethnographic and theatrical displays at the intersection of art and commerce, the Coney Island Museum is that rare venue that gives form to the history of memory. Constantly changing, it is a celebration of curiosity and seaside entertainment. The history of museums is an interesting study in aesthetics and cultural practice. Their conception in the 18th and 19th centuries in the US and Europe coincided with great changes in investigative and observational practices. The moment when private collections became public institutions was also a moment of great social upheavals – and it led to the public’s adoption of curiosity and wonderment as directives, even as observation and objectivity were the new goals of science. In the US, Peale’s Museum led to Barnum’s American Museum, which in turn led to the American Museum of Natural History. In the colonial world, Grand Exhibitions became industrial showcases, which became popular tourist destinations and tools of state education campaigns. The peak moment for all of these fruitful combinations was at the very beginning of the 20th century, when technology became a part of the mix and the world’s first amusement parks were born. Where better to explore the foreignness and possibility inherent in that history than in Coney Island, where the spirit of invention, curiosity, and spectacle came together so fruitfully and for so long? And what better venue to experiment with ways of evoking memory and loss than in New York’s last great Amusement empire?